President Kenyatta, wife, Catholic Bishops curtain-raise Pope’s youth meet with ‘Mukangala’ dance. When you have a Cardinal, dozens of Bishops, hundreds of priests and nuns in one place, you expect all things secular to go through the window. When you have politicians, as we have seen in the so-called prayer rallies, politics usually takes over. 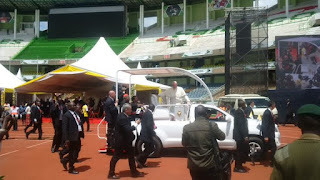 But Friday, at the Moi International Sports Centre, in Kasarani, we had His Holiness Pope Francis – and neither politics nor prayers took over, but song, dance and deep self-reflection. The thousands of the young people who had heeded the call of the Catholic bishops in the country turned up at the stadium to have their date with Pope Francis on his maiden tour in the country. They sat on the terraces singing, cheering, and dancing. As they awaited the Pope, a party mood engulfed the stadium.